In our early twenties, my friend Theresa and I shared a basement suite east of Commercial Drive and a tendency towards excess. It was a dark, damp little place last renovated in the early eighties by someone with a preference for shades of brown, but it was cheap and close enough to public transit and places we liked to go. The living room wall featured a cutout with a long fluorescent tube light at the top that was probably meant for displaying art, but it had a ledge just wide enough for a single liquor bottle, and long enough for maybe thirty. We wheeled an old TV stand in next to the bar and stocked it with shakers and shot glasses and swizzle sticks and hula dancer figurines and felt pretty good about our lives. The kitchen had a place to hang stemware, and we filled it with our mismatched collection of cups and glasses. Every evening after work we’d have cocktails, the alcohol equivalent to swamp water, and we’d feel like fancy ladies as we sipped mango Malibu and peach schnapps out of plastic martini glasses. But fancy cocktails weren’t our only bad habit. We were too similar to survive together for too long – though I suspect that if she’d never moved to Australia we’d still be together making bad choices in basement suites, probably sharing a set of kidneys – and one could easily convince the other that what anyone else would consider a bad idea was actually the best idea ever, like washing the kitchen floor with ammonia AND bleach (double the cleaning power!) or buying six Filet-o-Fish sandwiches with extra tartar sauce and a full slice of cheese at midnight because we were going to eat them anyway and it would save us another (inevitable) trip out and while we were at it maybe we needed apple pies too. We invented fourth meal but never thought to trademark it. One of the ways we enabled each other to do incredibly self-destructive awesome things was by claiming that whatever we were doing was in the name of health. At the time, Theresa was a vegetarian except for fish and pepperoni, and I was just beginning to get really excited about fibre. Theresa would go on long runs, and I would go to boot camp because I was too lazy to exercise unless I paid for it and would only go out of guilt at having spent the money. Because we had our health in mind intermittently, sometimes we would stock up on healthy things, either at Costco or at our parents’ houses when one of our moms was cleaning out her pantry and wanted us to take crap away. One of our kicks was dried fruit, which made an excellent snack for a vegetarian and a fibre enthusiast. Somehow we came to possess about a kilogram of dried apricots. One evening, in our pajama pants and holey sweatshirts with nothing to do and no desire to go out, we put on a movie and made the healthy choice to snack on dried fruit instead of Cheetos or Zesty Doritos, probably because one or the other of us had exercised and did not want to derail those efforts right away. Theresa brought out an opened zip-top bag of dried mango slices and a plastic bag of dried cranberries, and I found the apricots. Over the two hours the movie played, we ate the entire bag of dried apricots and most of the other fruit, which seemed like a good idea at the time because all that fruit fibre was bound to do good things for us. Theresa is a scientist, but somehow she didn’t foresee what it might do to us. Over the next two or three days we both learned a valuable lesson, and that is that fibre is a finicky friend, and that very easily you can take the relationship too far. Years later, I still approach apricots with trepidation. I buy them only a handful at a time (and rarely dried), because there is safety only in a certain number, but all I know is that the number is low. And yet I still love them. I have never been good at knowing when to give up on a thing. In the years between then and now, I have learned a little bit about balance. Maybe one apricot is okay. Maybe with a bit of protein, and a touch of sweetness. 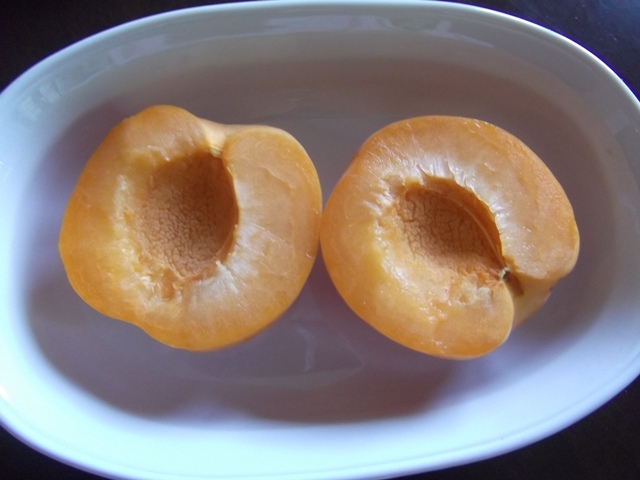 Maybe, like peach schnapps, apricots are not a meal but rather a snack that can be enjoyed in moderation. Place apricot in a small baking dish, sprinkle with cinnamon, and then dot with butter. Bake for 40 to 50 minutes, until soft and lightly browned. Spoon cottage cheese into a bowl. 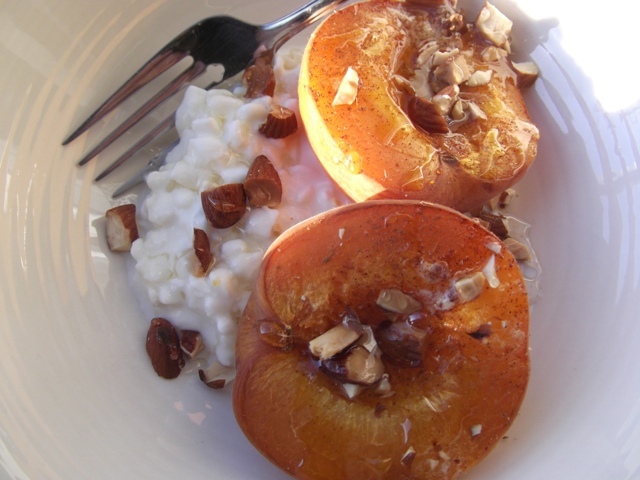 Place roasted apricot halves over top, sprinkle with almonds, and drizzle with honey. This is great for breakfast or for a snack before bed. If you don’t like cottage cheese, this is also quite pleasant with yogurt. Next > Roasted peach sorbet. This looks delicious and I think I can actually pull this one off since I’m no cook. Thanks for the laugh over the dried apricots. It has made my day. I am on my way to the gym only because of the YMCA taking money out of my account. They don’t really care that I haven’t been there all summer and I DREAD IT! The above comments are not from Sharon but me – Sharon can actually coook! Eek! Apricots can do that? I may never be able to trust the dried ones again! Oh man… just caught this post. Hilarious. All I can say is… I can pretty much relate to everything you’ve written here. Love it. 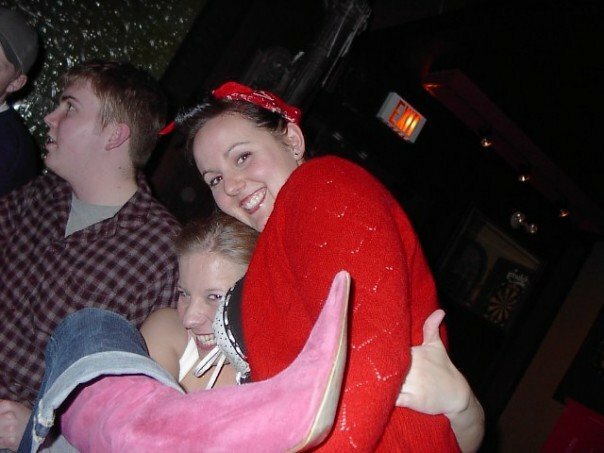 How did we all survive our early twenties? Maybe there was something to our perceived invincibility? The same things now just make me so tired!